My New Year Resolution is going well so far, I am having a massive clear out and being quite ruthless and throwing lots of things way. Mainly stuff that I have kept because "it will come in useful one day" and of course it never has, and probably never will! Amongst my finds were some blank cards, some I have thrown away, because they looked a bit grubby, but the rest I am adding tatting to so that they can be transformed into greeting cards. 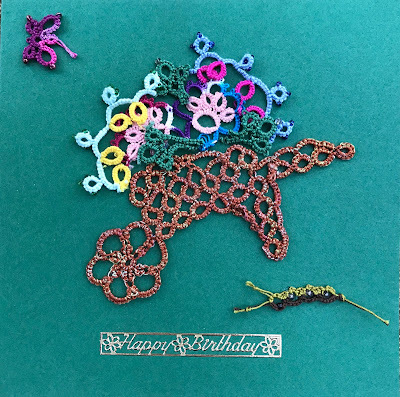 The only tatting which I had to do for this card is the wheelbarrow which can be found here on Jane's pattern site along with the butterfly and the slug. All other bits were found in my stash. We all need to find the discipline to throw things away! Those in our age group were advised to 'keep' everything, and we are now burdened with too much clutter. This is a really cute card, using bits and pieces! Well done! Certainly is a generational thing Kathy keeping so much stuff! The card is beautiful! So a good find indeed. Congratulations on having a clear out, I was forced into this just before Christmas because I realised that I had lost two special shuttles. I threw away four huge green garbage bags of " stuff" , I have lovely tidy cupboards and drawers, but I neither found any treasures nor my shuttles......it's all very sad. Maureen all that effort!!! Still worth it for the tidy cupboards and drawers, sadly not the shuttles though. Excellent way to use the pieces in your stash. Thanks Jane, now furiously making more wheelbarrows, seems like everyone will get the same card this year! !